The Daily Hampshire Gazette interviewed Alex about his weekly open mic night that he hosts in downtown Florence at Brew Practitioners Brewery and Taproom. Clubland caught up with F. Alex Johnson a few days after the open mic for this interview. Clubland: Did you pitch the open mic idea to Brew Practitioners, or did they come find you? F. Alex Johnson: I was on vacation with my soon-to-be fiancé (I popped the question that week) and was trying to figure out how to keep my career in music moving forward both as a source of income as well as an inspiration to keep practicing and performing. I had hosted open mics in the past (The Baystate, World War II Club, Silent Cal’s, etc.) and they were always great for not only showcasing the diverse talent we have here in the Valley, but also giving me a reason to “finish that damn song” or dive into a new cover I always wanted to learn. I had played [at Brew Practitioners] as a guest with Free Range Cats and knew the space would work really well and that the owners were definitely into keeping music/entertainment as part of their place. So I approached Tanzi (Cannon-Eckerle, co-owner with her husband Joe) and suggested it. She said she had been approached by a couple of people about possibly having an open mic but nobody had put forward a concrete plan. I won’t say my plan was concrete but with two or three cups of Costa Rican coffee in me, I wrote up a quick proposal and she said, “Sure, let’s give it a try.” That was four months ago and it’s been going strong since March 9. Clubland: What’s the time limit for each performer? Johnson: Depending on how full the list is (or gets) we’ve had people perform as long as 20 minutes at a stretch. Generally the “open mic golden rule” is 15 minutes or three songs. But some people only do one, or just read a story or, really, whatever they like. I think one of my favorite parts of this whole thing is that it hasn’t been done before in this building and there really aren’t any rules. The only thing I ask is that people respect the equipment on stage and have a good attitude toward the night. The people who come to the open mic range pretty widely in age and proximity. It’s not just a “downtown” thing like it had been at The Baystate. And with plenty of parking next door it makes it easy for out-of-towners to come and be part of it. Clubland: Could you share some examples of the diverse performers who’ve shown up at the open mic? Johnson: One of my favorite performances happened a few weeks ago. It was a full night (I have a list with 10 slots, which usually is all we have time for after I play my half-hour set from 7 to 7:30) and a 20-something guy had added himself on as number 11. He sat through a couple of hours of music with a beat-up acoustic (no pickup) on his lap. At 10 p.m. 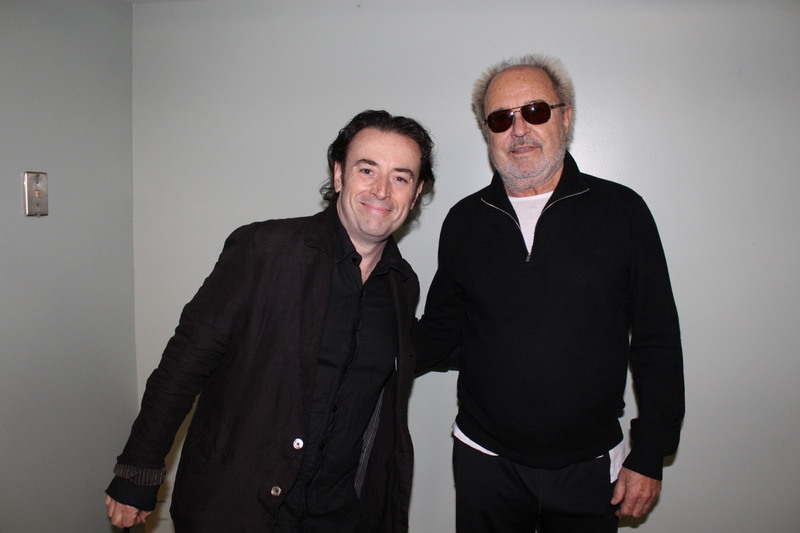 I told him he could do “a couple of tunes” because I wanted to get everybody on who had signed up. This dude turned out to be Chris Freeman from Parsonsfield, one of the best singer/songwriters in the area. He brought me, Tanzi, and several of the patrons/performers to tears with his version of “Two Sisters,” a nearly 1,000-year-old traditional Scandinavian tune, as well as one other song that just killed. It was a high point in the ongoing series and made me so very happy I get the opportunity to hold it every week. Other performers who stand out are Connolly Ryan who, as our local bard of the yard, puts his unique spin on classic rock songs and occasional improvised prose with the house band (aka whoever is there). Adam Dunetz, owner of The Roost and The Green Bean, has played (and on a bone broth fast, no less). We had two comedians in one night (a record), a couple of storytellers, a rare appearance from Court Etiquette (a band consisting of the kids of Connolly Ryan, Johnny Memphis, Steve Westfield and Scott Brodeur). Bow Bow (Drunk Stuntmen’s J. Scott Brandon) and Mark Herschler have come by and put on an amazing set twice. We’ve had blues players, an unreal dobro player, a brother from a Southern mother — Ron from Bowling Green, Kentucky, who, sadly, had to move back below the Mason Dixon … his originals will always be remembered. Tom Sturm plays a bunch and fills in when I am away. Our old friend Shawn Gunderson from the erstwhile Valley jam band, Yep! comes almost every week (he was our first performer ever) and always plays a few great tunes. Also in that week’s Gazette was an article on the open mic itself. Read that here or below. I’d heard about the freewheeling Wednesday night open mic at the Brew Practitioners Brewery & Taproom in Florence. Since it’s not limited to music of any particular genre — or music at all — you never knew who’d walk in or what they’d do in their minutes at the microphone. Stand-up comics. A trumpet player sitting in and getting brassy. Performance artists. Members of local bands trying out new material. A local poet improvising over live music. Storytellers. Musicians in the spotlight playing bassoon, ukulele, flute. The one constant since its start back in March is the host, guitarist/vocalist/songwriter and Colorway frontman F. Alex Johnson. He usually entertains the room for the first half-hour while participants trickle in, write their names on the sign-up sheet and become audience members until it’s their turn. My first available chance to check out the open mic happened to land on the first day the thermometer sailed above the 80 degree mark. It was a dreamy summery sunny May evening, and the gorgeous short-sleeve weather caused a shortage of participants — the sign-up sheet was crisp, white and very blank. Like any professional emcee, Johnson kept the slow night moving, playing lots of original material from his Colorway catalog, earlier solo work and even reaching back to songs he wrote while in his old band, the Drunk Stuntmen. “Every Wednesday I head out the door prepared to play for three hours in case nobody shows up,” he told me a few days later. One of the few attendees at the start of the night was a woman with a wedding dress slipped on over everyday clothes, her marshmallow-colored sneakers peeking out under the hemline. As Johnson began the open mic with his original song “Alfred’s Golden Rule,” she walked in circles, clapping on the 1 and 3. I took in my surroundings. Built in 1865, it was a space originally used as one of the support buildings for the Florence Sewing Machine Factory. Hanging from the old industrial ceiling were new lighting fixtures tucked inside bird cages. Bits of Brew Practitioners’ design — the logo, the beer taps — were inspired by the periodic table of elements. On a shelf in the corner was a cribbage board, a set of jacks, a box of pick-up sticks, playing cards, stuff for if you want to stay a while. It was a relaxing place to hang out. Off to the side, a vintage wooden phone booth beckoned — it housed a bright red “Food Fone,” a special hotline direct to Starr’s Pizza across the street. Lift the receiver, order your grub, and soon enough a delivery person shows up with your pie or sub — or in my case, french fries, which were still crispy and piping hot. Johnson had a looping pedal at his feet, enabling him to create his own bed of chords and then solo over them, helpful for showing off his serious guitar skills (and also filling some time on a light night such as this). On his Colorway song “Style of the Time,” he slowly built a solo into a torrential storm of notes for a thunderous climax — for a minute the taproom turned into a surging stadium, and the bar patrons clapped and hooted. A regular named Rufus (Chaffee) sat in, or rather stood in, playing his washtub bass on a couple tunes, including Johnson’s old Stuntmen song “Heidi.” Amazingly the washtub at times sounded like a cello. The woman in the wedding dress got up to play a song at the electronic piano — another regular, her name was Neverchange, as Johnson announced. With vibrato in her voice, she played “Golden Birthday,” an original song that included bits of others’ tunes. She had a combination of poise (making strong eye contact with the small crowd) and nervousness (stopping to laugh and reposition the sustain pedal, which kept sliding across the floor as she played). She explained that her clothing was a costume for a longer set she planned to play later in the evening. Rufus reappeared an hour after he’d left; he’d forgotten one of his shoes. About 15 people had taken seats in the main room, with 6 on the deck out back, the dusk in full dark bloom. I found myself sitting in with local poet/professor Connolly Ryan for two unplanned songs — The Kinks’ “Animal Farm” (with the lyrics called up on our iPhones in front of us, just in case) and then The Beatles’ “Across the Universe,” sort of … Ryan improvised stream-of-consciousness spoken-word while I played the piano, trying to follow his muse. At 8:45 p.m., members of the band Page Six arrived (Conor Dowling, Greg Eramo and Tom Sturm), carrying a conga and a bass guitar, and took patient seats at the bar until their time. The sun was down; the nightlife was picking up. Big thanks to Dave Madeloni at The Brattleboro Reformer for his great piece on the band in advance of our show at Metropolis on May 20, 2016. Originally published 5/19/16 in the Brattleboro Reformer. Colorway will be at Metropolis on Friday, from 10 p.m. to 1 a.m., 55 Elliot St. Brattleboro. There is no charge, but must be 21 or over. For information call 802-254-8500 or visit www.colorwaymusic.com. Dave Madeloni writes music reviews for the entertainment section of the Brattleboro Reformer. Well, we did it. 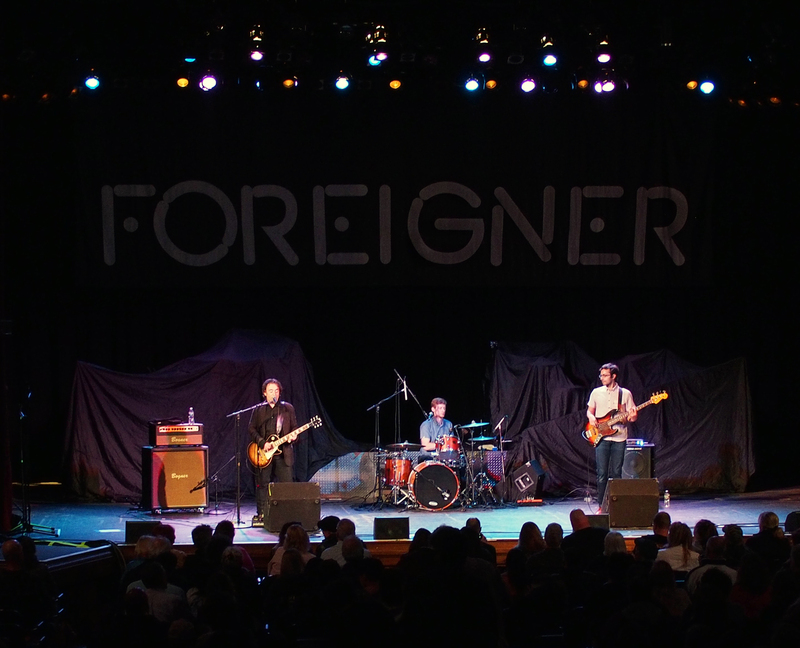 We played our biggest show yet on Friday, opening for classic rock legends, Foreigner at the sold out, 1,200 seat Calvin Theater in Northampton. Thanks to Rick Murnane for taking such great care of my stuff and keeping my guitars tuned when I wasn’t using them to rock. Thanks to Eric, Brendan, and all at Iron Horse Entertainment Group for adding us to the bill and treating us like rock stars. If you were there then you know the crowd was mostly in their seats and willing to listen to a band they more than likely had never heard of. And as it was they more than put up with us, it seemed like they really dug our stuff and the show we put on! So nice to see the smiling faces and hear the raucous applause. In fact, follow this link to see a vid of “Explain” from the show and see I’m not kidding ya. Special thanks to Brandon and Marian for helping out with the merch and for your words of wisdom. I even got to meet one of the most famous rock band truck drivers of all time, Carl. Keep on truckin’, Carl. Keep on truckin’. That’s about all I’m gonna say about that. Anyway, the show went really well, I was thanked by dozens of audience member (many of whom will be receiving this email for the first time, so thank you for signing up!) and I’m hoping this is just the beginning of things to come. Speaking of things to come, I have a solo show this coming Thursday, May 12 at Fort Hill Brewery in Easthampton. The show is free (tips appreciated) and it runs 5-7 (nice and early) so come on out and check out one of the best new breweries in the valley. And our next and final two shows this month are both in the great state of Vermont. We start at the top and work our way down starting on Saturday, 5/14 with a show at The Skinny Pancake in Burlington, VT. Some of you may know that’s a special day for me and the band because it would have been my mom’s 75th birthday. She coined the phrase “The Black Sky Sequined” in a poem she wrote about me many moons ago. It’s also a year anniversary of our album release show. So this should be a special night. If you have friends in the Burlington area why not share this Facebook Event with them? It would be much appreciated. And then, on Friday, May 20 we head up a ways to Brattleboro, VT to rock Metropolis on Elliot St. Bratt is a bit of an old stomping ground as I played The Common Ground, The Mole’s Eye and other various hippie hangouts back in the 1990’s-2000’s with Soup and then Drunk Stuntmen. So I’m really hoping we can find a whole mess of people who like to see original live music again. If you know anyone in the area please share this Facebook Event with them. Both shows are free. Well that’s about it, gang. Hope to see you at some of the shows and we’ll talk about June in a few weeks. But for all our tour dates at any time check out our site right here.